We are Phoenix Free Range,and we sell speciality eggs lovingly laid by our friendly flock of assorted poultry who wander around on our lush meadow in the heart of the beautiful Cotswolds. We are very local and only "just up the road " from Stroud near Bisley,where I was brought up.Everything regarding the poultry is done by just my husband and myself,so we oversee everything from the hatching of the chicks to boxing up the eggs and selling them at the market. 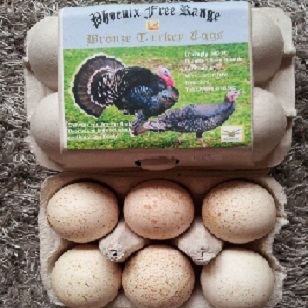 Our best seller is our amazing turkey eggs !…and it's due to having a pet turkey which gave me the idea of keeping a flock of female turkeys purely for egg laying ; I remember the day she layed her first egg and I thought how pretty it was with it's brown speckles and impressive size.The delicate creamy tasting large orange yolks were the most delicious I'd tasted,so I imagined that others would agree and there was a market out there waiting for me ! Fortunately there was,and now 2 years down the line we also have geese,Indian Runner Ducks ,quail and various rare breeds of chicken which we sourced for the colour and variety of their wonderful eggs : Brahma,Cochin,Cotswold Legbar for their blue eggs and Burford Brown for their deep conker-coloured shells. We also have a small flock of ex-battery hens who,now that they are free to enjoy the grass and sunshine,lay large tasty eggs,and we donate proceeds back to the charity ,the BHWT,which we re-homed them from. 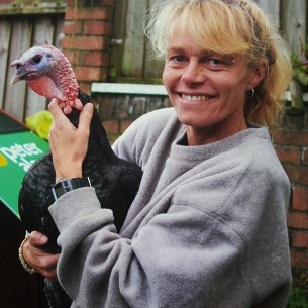 Everything is left to nature and therefore all our eggs are seasonal.The turkeys generally lay from April to October. We look forward to meeting you,and we are only too happy to talk to you about any poultry related matters and advice on buying,re-homing and keeping chickens. We are members of the Cotswold Choice Scheme,a brand that helps consumers buy goods that are products of the very landscape that makes the Cotswold a special place.It is a brand that recognizes and promotes the high standards of environmental ,welfare and landscape management for which farmers in the Cotswolds AONB are renowned.